We had a fabulous time in the Big Apple, so in honor of my trip, I thought an appropriate freebie would be an apple. And since the end of the school year is coming up fast, it might come in handy for teacher cards too. Click on the preview to download the cutting file. MTC and SVG files are included in the free download. Enjoy! Thank you so much for this post. 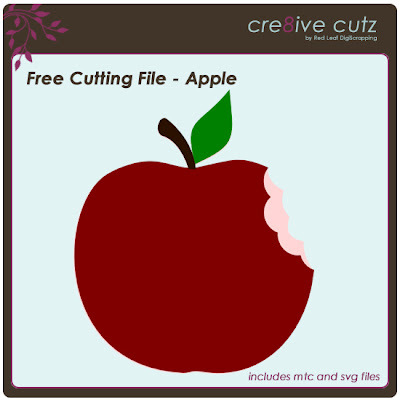 I want to let you know that I posted a link to your blog in Creative Busy Hands Cricut Freebies Search List, under the Food/Kitchen Related, Recipe Card(s) Theme post on Jun. 24, 2010. Thanks again.